John Carroll University, where I work, is a Catholic university. More specifically, we are one of 28 colleges and universities in the US that are Jesuit Catholic institutions, counting ourselves among institutions like Georgetown, Fordham, Boston College, Seattle University, Xavier, Gonzaga and others. The Society of Jesus is a religious order inside the Catholic Church and was formed in 1540. One of their main focuses since their creation was education, and they’ve founded high schools and colleges around the world. James Martin, S.J. has a great book, The Jesuit Guide to (Almost) Everything: A Spirituality for Real Life, if you’re interested in learning more. Anyways, let’s back up a few weeks. On February 28, Pope Benedict announced that he was resigning, catching all the world by surprise, including us. As a Catholic university in Cleveland, we were inundated with media requests for faculty members and our President, a Jesuit priest, to comment on the resignation and what would happen next. On March 12, the Cardinals met in Rome for the Papal Conclave, their secret meeting and voting for the next Pontiff. On March 13, the world was greeting with white smoke, signaling that a new Pope had been chosen. As the marketing group at a Catholic university, we were aware of the conclave, of course, and ready when the new Pope was announced. We figured that there would be media calls, and we’d write-up a news release, some homepage graphics and celebrate the new Pope on our social media channels. That all changed when Cardinal Jorge Mario Bergoglio was announced as the new Pope. 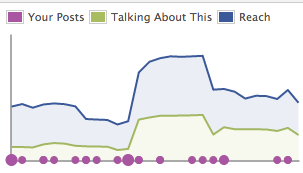 It was interesting to see the bump on Facebook’s insights the next week. That’s a pretty big jump in reach. If we use BlueFuego’s Facebook engagement equation, we get a total engagement of 10.7%, which is good, but this formula doesn’t take into account the number of shares (100) of any given point, which is becoming an important engagement metric. The shares of this post are what I believe helped us reach over 20,000 people, 18,000 of which were viral, according to Facebook itself. That evening, we put up a homepage rotating graphic celebrating the new Pope. The media descended upon campus, as not only were we one of the few Catholic universities in Cleveland, but we’re the only Jesuit university in town. We built a page collecting all the media mentions, interviews and more, which you can see here. It’s been a great and interesting few weeks on our campus. People are energized. I hope that the newfound press and awareness of what the Jesuits are will give JCU more visibility in the weeks, months and years to come.